Astrostudio is situated in the old village of Argiromouri, next to Exopolis, on the top of a beautiful hill which overlooks the sea and mountains. There are four air-conditioned studios, with separate entrances and big isolated balconies with a marvellous mountain and sea view that ensure your privacy and tranquillity. Each studio is fully equipped, fully furnished, with its own kitchenette and bathroom, a double bed or two single beds and a sleeper sofa. Astrostudio is easily reached from the sea town of Georgioupolis, a town which is on the national road between Chania and Heraklion, by driving to the top of the hill, to the area of Argiromouri, Exopolis. It is just 3km away from Georgioupolis, a 5-minute drive. It is 45km, away from the Airport Daskalogianni in Chania, 40km. from Suda Bay and 110km. from the Airport of Iraklion. When you reach Georgioupolis, we can pick you up and take you to your studio without any extra charge. We always welcome our guests personally; we make sure they feel comfortable with the studio they have chosen, and we also make any recommendations needed for their stay, dining, shopping, and travelling. A welcome basket will be waiting for you on your arrival with local drinks, fruits and traditional flavours. Feel free to ask us for anything you need. Our purpose is to make your stay as comfortable and carefree as possible without worrying about everyday housework like cleaning up or washing and changing linens. The Area is a very quiet place where you can relax, dream and enjoy your holidays while witnessing beautiful sunsets and sunrises. Great place for walking, running or enjoying traditional meals in the tavernas near Astrostudio. It is a place for both mountain and sea lovers as the studios are only a 5-minute drive to the beautiful, endless beach of Georgioupolis. Lake Almiros is ideal for those who like to fish or go on boat rides. In the town of Georgioupolis, you can find numerous tavernas, restaurants, cafeterias and bars. There is also a playground for our little friends with a skating park, a bike lane and an outdoor gym and horse riding lovers can enjoy their rides in the area, as well. Georgioupolis has a great variety of supermarkets, mini markets, and local traditional markets. There is also a great choice of shops where you can find anything you need. Interested in boat rides and hiking trips? All these are available at the famous natural Lake of Kournas, only a ten-minute drive from Georgioupolis. The Area is a very quiet place where you can relax, dream and enjoy your holidays while witnessing beautiful sunsets and sunrises. Great place for walking, running or enjoying traditional meals in the tavernas near Astrostudio. 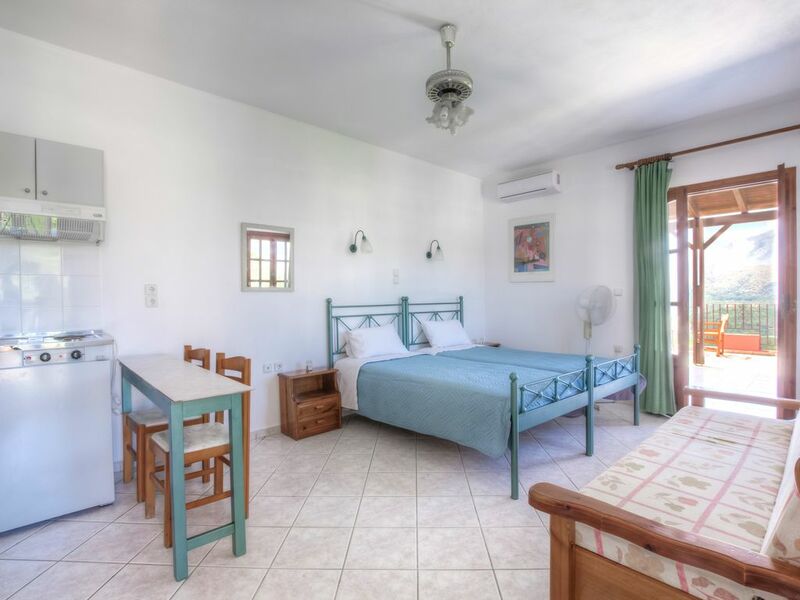 Astrostudio is a place for both mountain and sea lovers as the studios are only a 5-minute drive to the beautiful, endless beach of Georgioupolis. Lake Almiros is ideal for those who like to fish or go on boat rides. kitchen contains at least a fridge/freezer, hob and sink. We where there for 2 weeks. The studio is nice. We had a splendid view an the coast, hills and the white mountains. It was very comfortable to live there: livingroom, bed, kitchen and bed had evereything you need. Especially the roof terrass was nice to sit on. Besides land lady and landlord were very friendly and shared some time with us, as long as we wished it. From there it is quite near to the Cretan village Georgioupolis or the towns Chania and Rethymno. Both towns you can reach with the public bus. They are all nice to visit. The coast, the sand and the warm sea are wonderful - we enjoyed it so much. Thank you both for staying with us and for having the chance to meeting two wonderful people. Malgré notre arrivée tardive, nous avons été très bien accueilli par le mari de la propriétaire ! Le logement n'est pas très grand mais largement suffisant pour un couple. En effet, avec le temps et l'immense terrasse du logement, on passe tout notre temps dehors ! La vue de la terrasse est splendide à presque 360°. Je recommande et nous y retournerons ! Thank you for your kind words and hope to see you again in the future!!! Wir waren absolut zufrieden. Unsere Vermieter haben uns aufgrund Verspätung unseres Fluges am sehr späten Abend noch mit einem Essen überrascht und begrüßt. Wir waren ziemlich gestresst von der ganzen Verspätung, hatten nichts gegessen und umso mehr haben wir uns über diese herzliche Aufnahme gefreut. Das Apartment war sehr sauber, alles vorhanden was man braucht, sogar der Kühlschrank war mit Getränken und Obst gefüllt. Meerblick war herrlich mit großer Terrasse. Thank you for your kind comments. It was a pleasure to host you and we are looking forward to seeing you again! Bereits bei unserer Ankunft wurden wir herzlich von den Gastgebern empfangen. Wir fühlten uns sofort wohl und willkommen, durch die familiäre Atmosphäre. Im Apartment standen für uns frisch geerntete Tomaten und ein Hauswein bereit. Das Apartment hat uns natürlich mit seiner großen privaten Terasse und dem traumhaften Ausblick über das Tal, die Berge und dem seitlichen Meerblick sofort überzeugt. Man sitzt ungestört und hat einen wunderbaren Ausblick, sowohl am Morgen als auch am Abend. Es ist praktisch eingerichtet und sehr sauber. Mehrmals wöchentlich wird es gereinigt inkl. Handtuch - Bettwäschewechsel. Es ist fast wie in einem Hotel. Die Apartmentküche ist zwar nicht zum Kochen von Menüs ausgelegt, aber einfache Gerichte lassen sich gut zubereiten. Sollte doch mal ein Pfanne fehlen, wird sie auf Wunsch gleich am nächsten Tag von den Gastgebern vorbeigebracht. Was für ein Service. Die Umgebung ist sehr ruhig und hat einen dörflichen Charakter. Trotzdem ist man mit dem Auto in wenigen Minuten im Ort und auch am Strand. Es ist ein guter Ausgangspunkt für Ausflüge jeglicher Art (Berge oder Meer). Wir bedanken uns für die schöne Zeit. Wir konnten uns richtig gut entspannen und empfehlen es natürlich absolut weiter. Preis - Leistungsverhältnis ist unschlagbar! It was a pleasure to host Anja and the Chef. They are very kind, polite and interesting people. They kept the apartment in perfect condition and were very cooperative, communicative and precise. I definitely recommend them as guests!